Close to the Slovenian border, the province of Gorizia opens out onto the Adriatic Sea and enjoys an ideal location. Do you dream of the beautiful landscapes of Italy? Book your stay on our Homair campsite in Gorizia! It’s ideal for seeing the splendours of the region, all from the idyllic setting of a starred campsite with all the home comforts. The nature around Gorizia is delightfully rich and diverse. Along the coast, you can visit the superb Grado lagoon to relax for a while, lounging on the golden sand in front of an impressive network of canals between the islands and islets. Not far from the coast, two nature reserves let you admire numerous bird species: the Riserva Naturale della Foce dell’Isonzo and the Riserva Naturale della Valle Cavanata. To taste some of the best wines in the world, and to see breathtaking panoramic views, our guests will love visiting the Isonzo plains and its vast stretches of vineyards. If you want to go somewhere a bit different and see the distinctive landscapes of the region, you should head to Carso, a rugged and rocky limestone plateau richly covered in colourful flowers. With an exceptionally rich history, the town is home to many tourist sites, like the Museum of the Great War. Among the unmissable sites, Gorizia Castle, a splendid monument dominating the town, offers a stunning view over the surrounding countryside of Collio and Carso, as well as a part of Slovenia. Looking for an unforgettable stay where nature and culture meet? 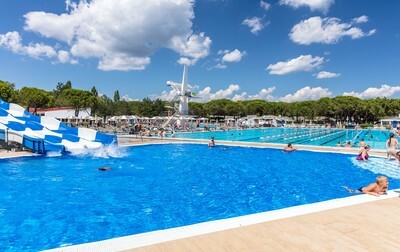 Book your place on our Homair campsite at Gorizia for a luxury holiday full of La Dolce Vita.